Nick and I have been hanging out with Nick’s grandma the past few days, watching the Giants’ Post Season magic (I scored my first baseball game there! 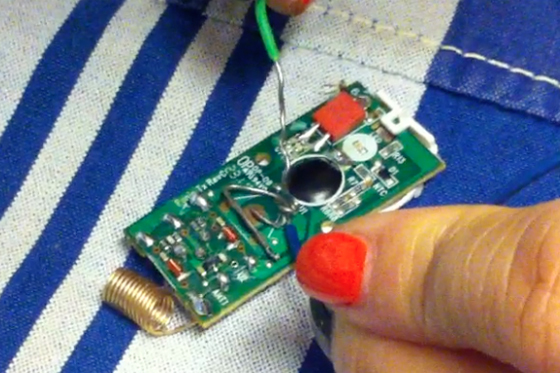 ), and we realized the other day that her doorbell wasn’t working! Boo! But what a great opportunity to help Grandma and do something new at the same time! 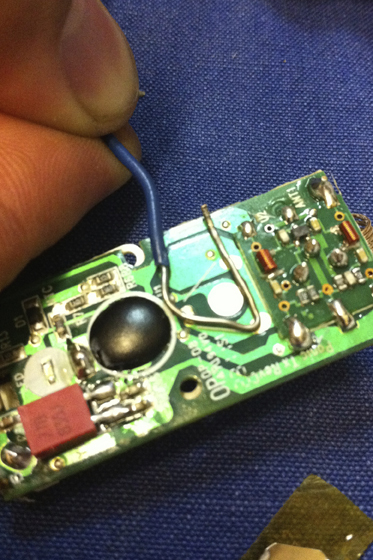 So we thought for a while and wondered, “could we just hard-wire the old button mechanism to the new wireless receiver?” We decided to try. 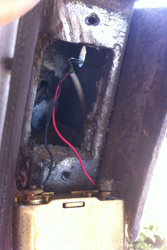 First, we removed the gate panel to get to the doorbell wires so we could see what was going on there. Yes, those are the hands of my lovely assistant, Nick. My hands aren’t that nice looking. Ha! 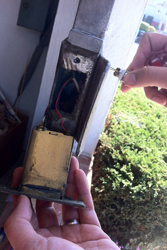 So, basically the doorbell button is installed in the little hole in the gate (you can see the hole in the second picture), and that button as well as the gate buzzer (the bronze mechanism) are attached to the wiring that runs through the house. 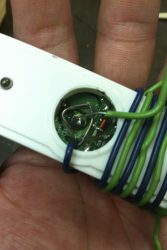 The green and yellow wires (seen more clearly in picture 3) are connected to the doorbell button, and the red and black are connected to the buzzer. 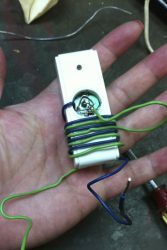 All four of the wires get insulated together in the white sheath, then they run through the house and upstairs they are connected to the doorbell (which is activated when someone presses the doorbell button) and the buzzer button (which activates the gate buzzer downstairs). Hope I didn’t make that sound vastly more confusing than it is. So! 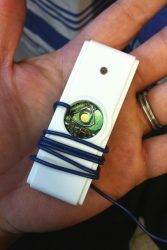 What this meant is that we had to see if we could use the existing wires connected to the doorbell button, and make them trigger the wireless transmitter (as if we were pushing that button). 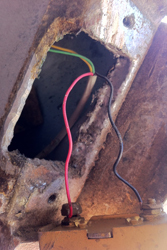 We looked at existing doorbell wiring and followed it as far as we could, then we tested it to make sure there wasn’t a fault between there and the doorbell. If we could rig the wireless transmitter right, we’d want to connect it at that spot. 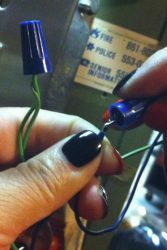 Our hope was that by following the existing wiring as far as we could, we could get a nice, close range for the receiver (the new electronic bell upstairs) and transmitter (the button unit we were hacking) to be able to work together. 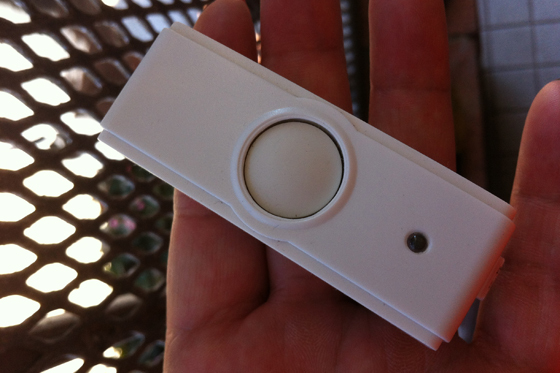 Alright, so with the doorbell, basically pressing the button is the same as the switch being flipped to “on” (causing the bell to ring), with the release of the button being the same as the switch flipped to “off” (the normal, no sound state). Make sense? Cool. 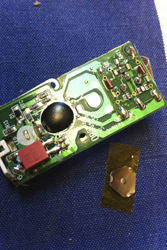 As you can see above, when taken out of its little plastic box, the wireless transmitter is basically a small board with circuits, an antenna (the small copper coil at the top left of the board), and the rubber button placed on the “trigger”. 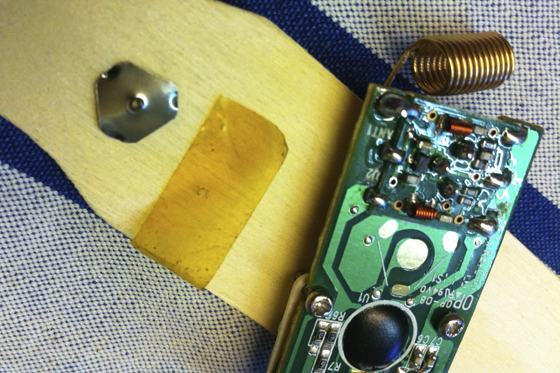 We removed the rubber button and found a small metal plate that was lightly taped atop a larger, center conductor. 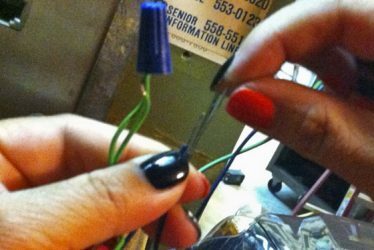 The plate touched three spots around a center conductor at all times (similar to the “white wire” in the diagram above), but then when the button was pushed, the center of the plate touched the center conductor (like the “black wire” above), the circuit was closed (or completed/connected), current flowed, and a signal was transmitted to the receiver (the bell). 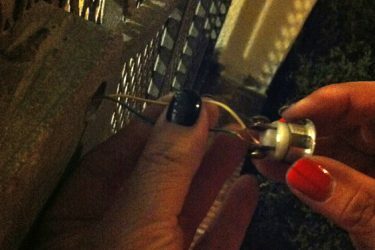 We could replicate this action by using the wires that were on the old doorbell; one wire we’d have to connect to the three dots around the center conductor, and the other we’d have to touch to the center conductor (without touching the other wire, or else the current would constantly be connected, or “on”). 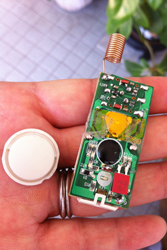 When the old doorbell was pushed, the circuit would be completed, and trigger the wireless transmitter (we hoped). *Note: In the photos, the wires are green and blue (instead of green and yellow like the photos at the top) because we found that there had been a previous wire repair just past the spot shown in the photos above, and green and blue wires were used from that point on instead of green and yellow. 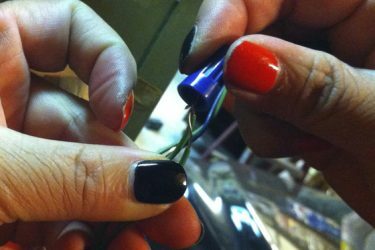 When we followed that wire to its end inside the garage, we realized there was enough of it for us to snag some and try our wiring hack with that. Ha ha ha, lots of character there. Well, I liked it anyway. 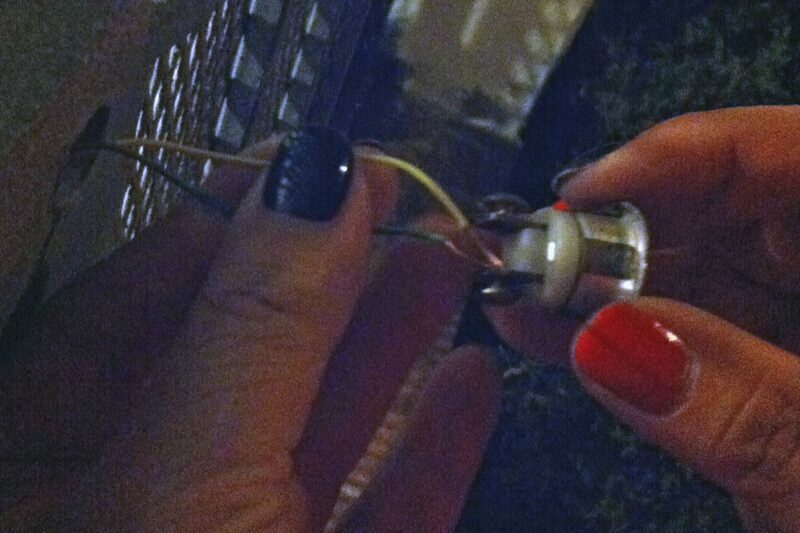 Now, we just had to hard-wire our snazzy new transmitter to the line that ran from the doorbell, and we’d be set! 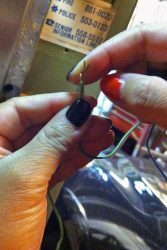 I joined green to green, twisted the wires together and capped them, and then did the same with the blue wires. Wahoo! We were almost done. 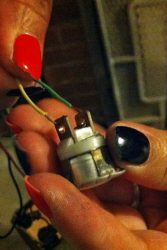 Now we just had to reattach the original doorbell button to the wires in the gate (remember those are still green and yellow), put the doorbell back in its seat in the gate, and we were good to go! This was a super fun project, even though in real time it took several hours; but that was mostly because we were messing around with a lot of this stuff for the first time and figuring things out as we went along. 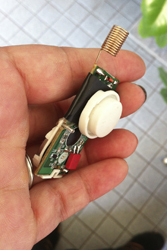 In the end though, we were really proud to be able to fix Grandma’s doorbell situation and give her a fancy new electronic chime that she can change whenever she wants a different sound. Yay! FTC Disclosure: This post contains affiliate links, which means if you purchase something from a link, you won’t pay a penny more than normal, but we’ll get a kickback of a few cents to help keep us sharing with you and the rest of the Interwebs. Thanks!